Father Leonard Tartaglia was sometimes called Hartford’s “Hoodlum Priest.” Like the 1961 film of the same name, Tartaglia ministered to the city’s poor and disenfranchised. He challenged institutional racism wherever he found it, in the state and in his own church. 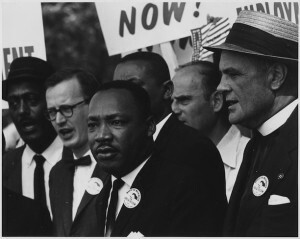 On March, 11, 1965, at the height of violent confrontations over civil rights in the South, Tartaglia and a handful of other clergy from New Haven and Waterbury headed for Selma, Alabama. On the same night that Tartaglia left for Selma, Unitarian minister James Reeb died from wounds received at the hands of a Selma lynch mob. Reeb had traveled from his Boston home to support voting rights marchers under attack in Alabama. The critically acclaimed motion picture Selma dramatizes his story. While activists in Alabama made a second attempt to cross the Edmund Pettus Bridge into Montgomery on March 9th, Hartford high school students and activists held a vigil at the governor’s residence to focus local attention on the Selma attacks. They brought legislative business to a standstill a short while later, simply by entering the state capitol, where an unusually large number of anxious police officers assembled to meet them. Meanwhile, in Montgomery on March 25, a victorious rally of 25,000 people celebrated the third and final attempt to cross the bridge. Among them was the Reverend Richard Battles of Hartford who led 90 Connecticut residents in joining the southern march. That same night, along Highway 80, the Ku Klux Klan assassinated Viola Liuzzo, a volunteer from Detroit who shuttled protestors between Selma and Montgomery. Reverend Richard Albin from the Greater Hartford Campus Ministry saw Liuzzo’s wrecked car as he rode a bus along the highway. Albin acted as security at the church that had been Liuzzo’s base. Exactly a week earlier—to the hour—a young black teacher from Hartford and her coworkers had been harassed and almost run off the same road, possibly by the same men. Reverend Arthur L. Hardge, an African American minister from New Britain who joined the Freedom Riders in Florida in 1961 to test the federal law banning segregation at interstate bus facilities. Authorities convicted him and eight other clergy for “unlawful assembly” and sentenced them to 60 days in prison. After four days of lockup, and pressure from the ACLU, officials granted all nine protestors clemency. Seventy Yale students who traveled to Mississippi in October 1963 to assist a young African American who ran for Lt. Governor. They returned after the election with stories of bogus arrests and beatings. Elizabeth Faith Brown, a 44-year-old Salvation Army worker and UConn student who spent a week in a Florida jail in March 1964 on trespassing charges. Police arrested her and other Connecticut residents while they worked to desegregate a motel restaurant. In Voluntown, the Committee for Non Violent Action (CNVA) responded to the Selma call by sending 19-year old Peter Kellman. He worked behind the scenes, raising and lowering tents each day for the historic march from Selma to Montgomery. Peter stayed on after the march, building the Selma Free Library, registering voters, and organizing an alternative political party with the Student Nonviolent Coordinating Committee (SNCC). 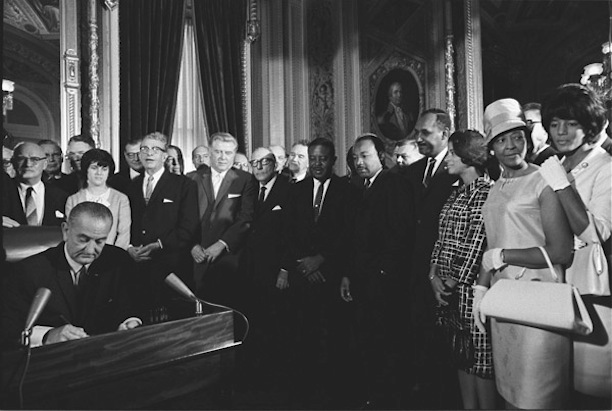 Thanks, in part, to the protests and demonstrations in Alabama, legislators signed the Voting Rights Act into law on August 6, 1965, outlawing discriminatory voting practices in the United States. The act was amended many times, as several states—including Connecticut—found ways to sabotage the law’s intent. It was not until 1972 that Connecticut finally eliminated literacy tests and long residency requirements for voter registration. In 2013, however, the US Supreme Court ended oversight of states that regularly violated the Voting Rights Act. Consequently, before the November 2014 elections, voter suppression initiatives in North Carolina, Kansas, Virginia, and Florida actually denied hundreds of thousands of registered voters “their basic right of citizenship,” according to the Brennan Center for Justice. Crosby, Emilye. 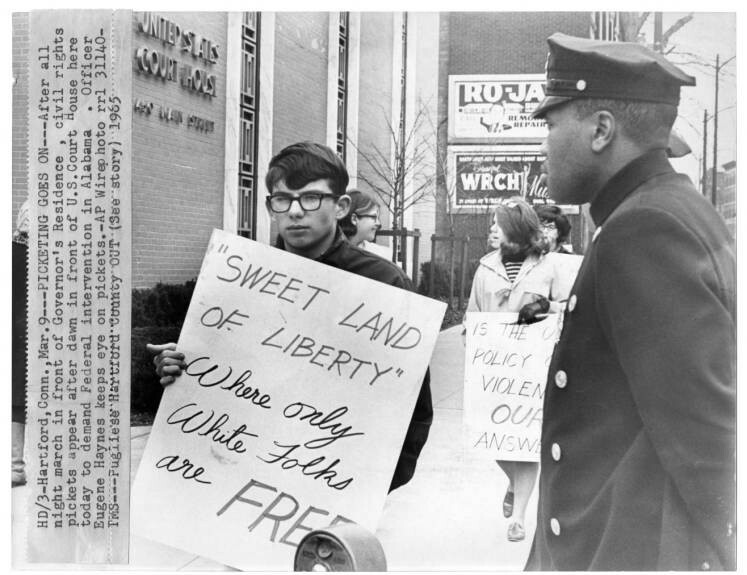 Civil Rights History From the Ground UP: Local Struggles, a National Movement. Athens, GA: University of Georgia Press, 2011. From Selma to Montgomery: The Long March to Freedom. New York, NY: Routledge, 2014. “1,000 Gather For Waterbury Rights Rally.” Hartford Courant. April 5, 1965. 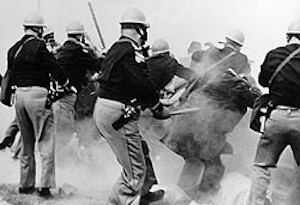 “Full Quota of 90 Ready For Selma Rights Trip.” Hartford Courant. March 17, 1965. “State Priests Off to Join Dr. King in Selma Drive.” Hartford Courant. March 12, 1965. Holmberg, David. “Throngs in State Pay Tribute To Minister Slain in Selma.” Hartford Courant. March 15, 1965.